We all know how easy it is to lose track of time while surfing the awesome internet. So I came up with the brilliant idea of putting the list up here for later referral whilst sharing it with you 🙂 That’s double karma! Although I think there could be wound up a lot more of pictures, it’s already an awesome concept. On this page you can enter any youtube video and make Osama Bin Laden watch it. No need to explain the content of this page. It’s better populated than the Putin page and has a higher rofl count. Was your Mom hot? Or your kid’s mom, or your grandmom, or your friend’s mom, etc…Click submit to send us a photo because let’s face it, before your Mom was just your Mom… Your Mom Was Hot! Not sure whether I should call this funny or 200% wasted time… But anyhow, the title itself made me lol at least a bit. Everything is better with balls in it! keep an eye open for the upcoming stuff. If you have some awesome time wasting links yourself, share them in the comment section. Posted on 19/04/2011 19/04/2011 Categories Fun, Info, PoliticsTags dilbert, suitsLeave a comment on If this is meant for you, you’ll know it! Don’t forget to check out the Whitespace’s upcoming events page. There’ll be quite a lot of nice talks in the upcoming weeks. I think this is a well chosen nick (Dutch for TheCop). One of the cool things about the internet is that you can actually see other people doing even more idiotic stuff than you’ve ever done yourself. So here is a bunch of clips I found of people shaving themselves with rocks, knives, bigger knives and machettes. Continue reading Shave like a boss! Posted on 07/03/2011 Categories FunTags blades, Extreme, knives, ShavingLeave a comment on Shave like a boss! Keep 25 & 26 March free on your agenda’s! Today was the first day, I actually enjoyed being served by an error page. 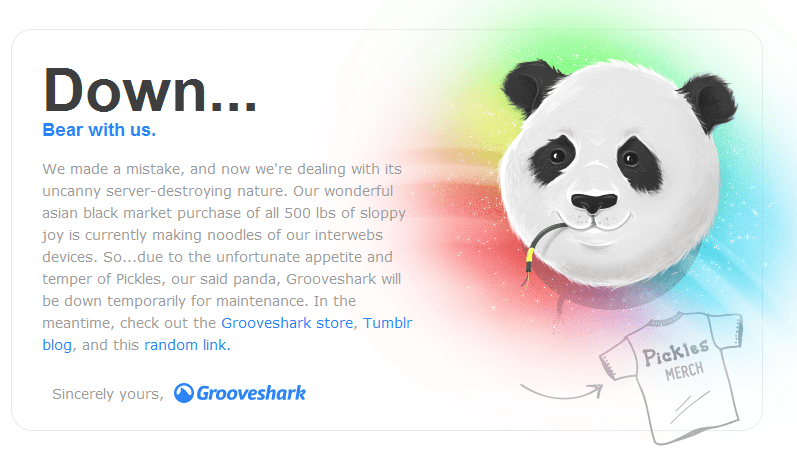 It seemed like Grooveshark had some problems, so instead of serving us some music, they gave us some lolz. So, if you haven’t heard of Sintel before, this is nothing too soon. Sintel is a project just like Big Buck Bunny, that’s completely made with Free and Open Source software. It’s more or less a promotion movie for Blender, that’s also why the Blender Foundation is sponsoring the project. For those that don’t know Blender, should check it out. It’s a Free and open source 3D content creation suite. For all those people that are still thinking that still think that huge and task specific applications are only available for huge price’s and delivered by closed private company’s, this is your turning point. In less than 2 months the full Sintel Video will be released… I can hardly wait. It’s also fun to check the video’s on the BlenderFoudation youtube profile, it’s full of interesting reactions and insights. Posted on 16/05/2010 16/05/2010 Categories Applications, Fun, TipTags Awesome, Blender, modeling, SintelLeave a comment on Sintel trailer released. I wrote a script to sort images according to their width and height. I found myself in need of such a thing after my previous post on how to download 4chan images automatically. I used this script a few times to get all the wallpapers on the /wg/ board. After a few GB of images, nautilus starts to get a headache when opening the containing folder. So I needed to split it up in different folders. So here’s the script that does it. There still seems to be a problem with character escaping when the filename contains a ” – ” in it’s title. But I’m too tired to figure it out now.